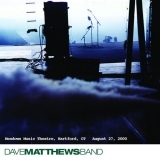 Live At Red Rocks 8.15.95 (1997), Remember Two Things (1993), Live In New York City (2010), Live Trax Vol. 1: Worcester, MA December 8, 1998 (2004), Live Trax Vol. 3: Hartford, CT August 27, 2000 (this album) (2005), Live Trax Vol. 7: Hampton, VA December 31, 1996 (2006), Live Trax Vol. 9: Las Vegas, NV March 23-24, 2007 (2007), Live Trax Vol. 15: East Troy, WI August 9, 2008 (2009), Live Trax Vol. 20: New York, NY August 19, 1993 (2011), Live In Atlantic City (2011).